It’s a privilege visiting places with friends that are local – it opens your eyes to another side of a place that is not privy to guidebooks or tours. In my case, being exposed to favourite food of locals in Delhi really changed my impression of city. I will no doubt return for another gluttonous excursion. New Delhi. For most, the city represents the epicenter of political India, speckled with beautiful gardens and remnants of the Mughal empire. I first visited Delhi seven years ago as part of my family’s “Golden Triangle Tour” around North India. I was not only fascinated by the history of Old Delhi, visiting monuments such as the Red Fort, Humayun’s Tomb, Qutb Minar and Jama Masjid, but also by its significance in the development of 20th century India. It was a surreal feeling to see India Gate, the symbolic point of activism that often brings the nation to a standstill. Driving through the government areas with their manicured lawns, pristine gardens and orderly traffic was a reminder of just what a land of contrasts India was. While I ticked all the “must sees” of Delhi on that trip, I had no idea how a local Delhiite lived…until I visited Delhi again on two occasions in the last year, staying with friends who were locals. My perception of Delhi changed – I saw the “new” side of New Delhi, with its huge malls, cosmopolitan restaurants and bars, and sprawling development in Gurgaon. And most importantly, I discovered what a foodie city it is. And this reason alone is what will make me return to Delhi time and time over again. I would kick off the morning with a journey to old Delhi, one that could take as little as twenty minutes or as much as an hour and a half, depending on how many autorickshaws, cars, buses and trucks fill the narrow roads around it. First stop is Chandi Chowk for breakfast – paranthas and lassi at the Paranthe Wali Gali, a place that has served the likes of Jawarlal Nehru. After walking around Chandi Chowk for little while and doing some shopping, next stop is the legendary Karim’s, a hole in the wall eatery behind the Jama Masjid serving the tastiest Mughlai dishes I’ve ever had. Apparently it was started in 1913 by a cook whose family used to work in the royal kitchen of the Mughals. While places such as Bhukara have won international accolades for their Mughlai food, to me, Karim’s is the real deal. Line up with the crowds, sit down in the dhaba-style shop and order their legendary mutton burra, seekh kebabs and sheermal (a type of bread) – locals will swear by it. I would then head round the corner to the Old Famous Jalebi Wala, another Delhi institution founded in 1884 that serves the best jalebi that I have ever tasted – so thick, soft and juicy that it just melts in your mouth! 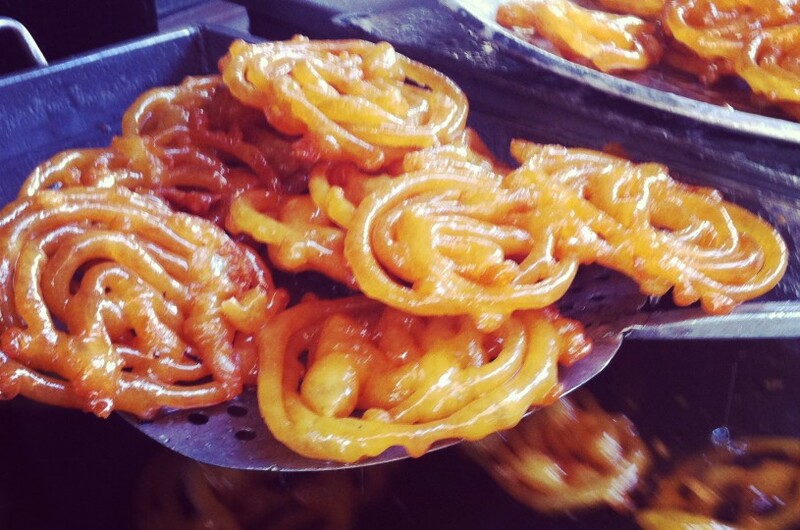 My dad first took me to this place seven years ago, describing it as a place he used to visit when he was a child living in Delhi – the jalebi was just as good! Time to leave Old Delhi and head over to Connaught Place to Haldirams to have my two favourite items on the menu – the raj kachori and chole bhatura. Both were the best I’ve ever had – in fact, I actually hadn’t ever tried raj kachori until I visited Haldirams. The chole bhatura was just so soft and fluffy – just delish. Finally, I would head over to the hip Hauz Khas Village, an artsy and eclectic village filled with a plethora of artist studios, quaint bookshops, and of course, cafes, restaurants and bars. I love the vibe of HKV – the cafes are usually three storeys high, with narrow stairways that transport you up to each level that surprises you when you arrive, usually culminatin at a roof top terrace. While most guides tell you to go to Gunpowder, the well-known restaurant serving southern cuisine, my personal favourite is Yeti – a restaurant I would never have found if it weren’t for my local friend. Known for its Nepali thali, Yeti has incredible Tibetan food – it was the first time I had tried momos, which are dumplings native to the Himalayan region, similar to gyozas. And with that, is the end of a very productive day. Since this post was written, we have added a food experience in Delhi that lets you explore the best of Old Delhi – the Chandni Chowk Gastronomical Tour!